Rhyming Dictionary: The best rhyming dictionary ever created, containing over 120,000 words and providing 21 different rhyme types, including perfect rhymes, reverse rhymes, assonnance, consonance, and much more. Webster’s Dictionary: A 115,000 word Webster’s dictionary, with full definitions. 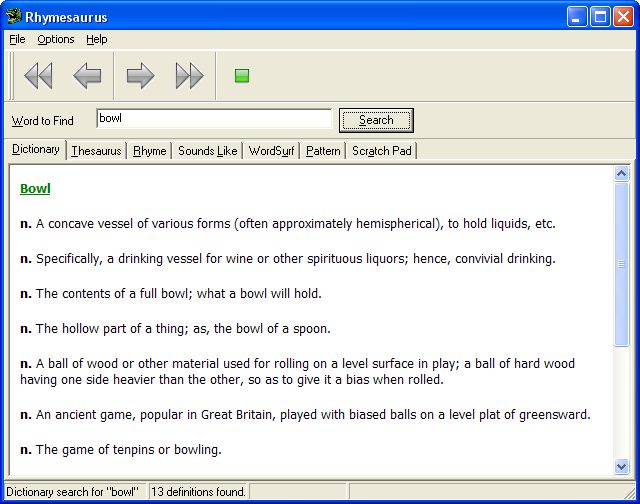 Roget’s Thesaurus: A full Roget’s Thesaurus, with 1000 categories. Sounds Like: A unique “sounds-like” reference that uses two different algorithms for finding words that sound similar. 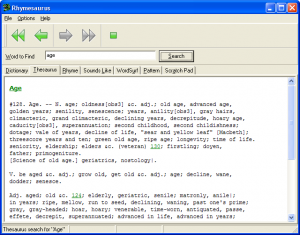 WordSurf: a powerful reference tool with 120,000 root words for finding synonyms, antonyms, word relationships, and much more. Pattern Matching: A unique pattern matching tool for finding words based on their lexical stress patterns. Ordinary rhyming dictionaries give you a list of perfect rhymes, but that’s all. Rhymesaurus gives you so much more. 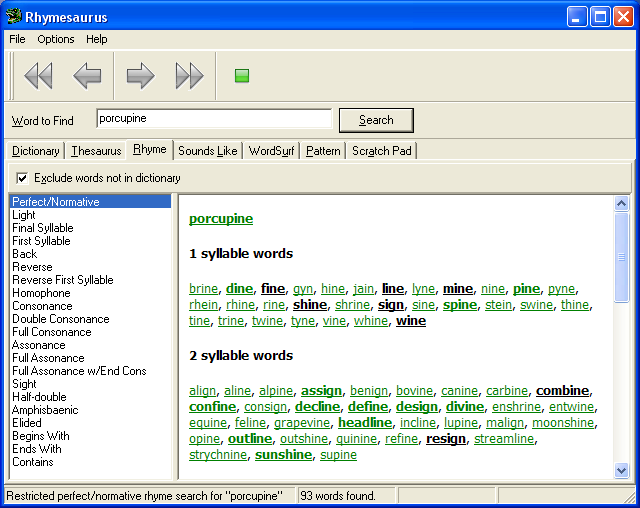 In addition to perfect rhymes (also called true rhymes or normative rhymes), Rhymesaurus’ 120,000-word rhyming dictionary lets you search for end rhymes, reverse rhymes, light rhymes, first-syllable rhymes, homophones, matching assonance and consonance patterns, words containing specific sounds, and much, much more. 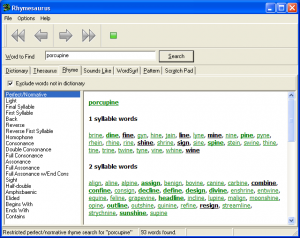 To make the results easier to navigate, Rhymesaurus highlights words based on their frequency of usage in the English language. More common words are more heavily highlighted, making them easier to spot. But we don’t just stop there. While other rhyming dictionaries just give you a list of words, Rhymesaurus also displays a list of well-known idioms, phrases, and cliches that end with rhyming words. Moreover, Rhymesaurus is built around a powerful hypertext browser interface, making you as productive as possible. 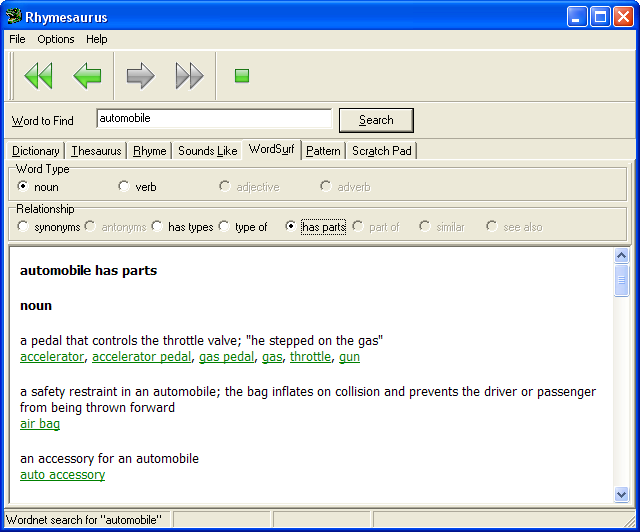 After looking up a word in one reference, you can click on any underlined word to find that word in any of Rhymesaurus’ references. 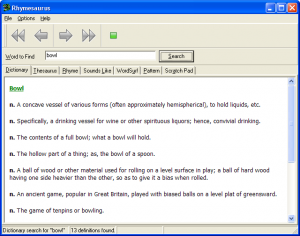 This allows you to quickly jump between the dictionary, thesaurus, rhyming dictionary, sounds-like reference, and Rhymesaurus unique “WordSurf” feature, following a lexical trail until you find just the right word. In addition, Rhymesaurus includes “history” buttons, letting you move back and forth among your search results, just as you would with a web browser. Every writer needs to look up word definitions now and Rhymesaurus has a complete 115,000-word Webster’s dictionary to make it as easy as possible. Simply type in a word and press [Enter]. 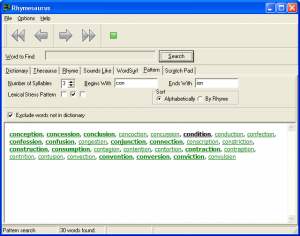 Rhymesaurus gives you all of the word inflections and definitions instantly. You may never need to head to the bookshelf or even go online to use the dictionary again. Download now! Try it FREE for 30 days! No reference shelf is complete without a comprehensive Thesaurus, and Rhymesaurus includes one of the best. Our Roget’s Thesaurus contains 1000 word categories, with tens of thousands of synonyms and antonyms, organized by nouns, verbs, adjectives, and adverbs. Simply type in the word you are looking for and press [Enter]. Rhymesaurus will show you a list of all of the categories that contain your word, allowing you to pick the category that most closely matches the meaning you are looking for. For example, type in the word “carriage,” and Rhymesaurus will show you a list of categories that includes “appearance,” “conduct,” “fashion,” “vehicle,” and more. If you are looking for synonyms for a horse-and-buggy, click on “vehicle” to get a list of several hundred. If you were actually looking for synonyms for comportment, click on “conduct” to get an extensive list of synonyms. 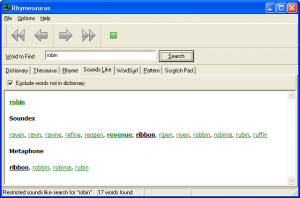 Within each word category, you will also find hyperlinks to other word categories, allowing you to easily “surf” from one word category to another. For example, starting at “love,” you might quickly jump to “benevolence,” then “friendship,” then “sociality,” “courtesy,” and so on, with each word category containing hundreds of synonyms and antonyms. Writing tongue twisters? Can’t remember how to spell a word? 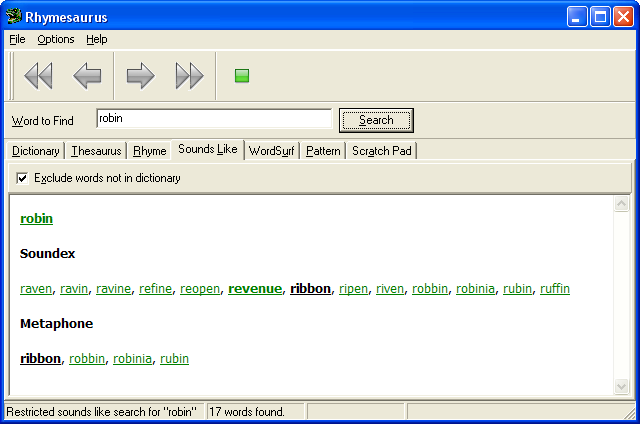 Sometimes it’s helpful to see a list of words that sound like another word, and Rhymesaurus handles this with aplomb. 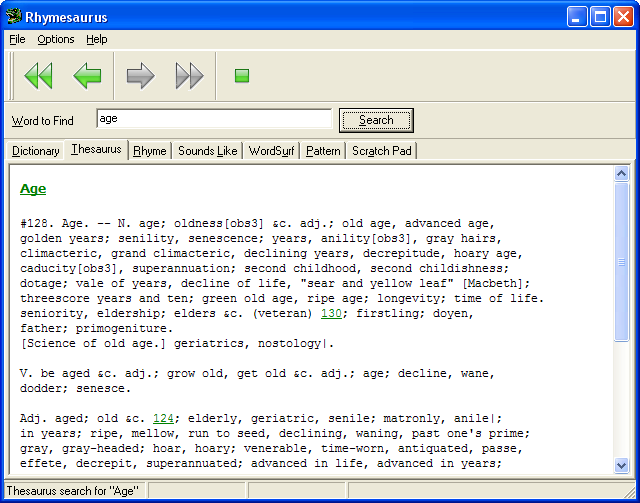 Using two different “sounds-like” search algorithms, Rhymesaurus gives you a list of all of the words that sound like your word. Type in “thunder” and you’ll find a list of words such as “tender,” “tundra,” and “thundrous.” Type in “darling” to get words such as “derailing,” “drooling,” “thrilling,” and more. Rhymesaurus runs on Windows 2000, XP, Vista, and Windows 7! Try it FREE for 30 days! 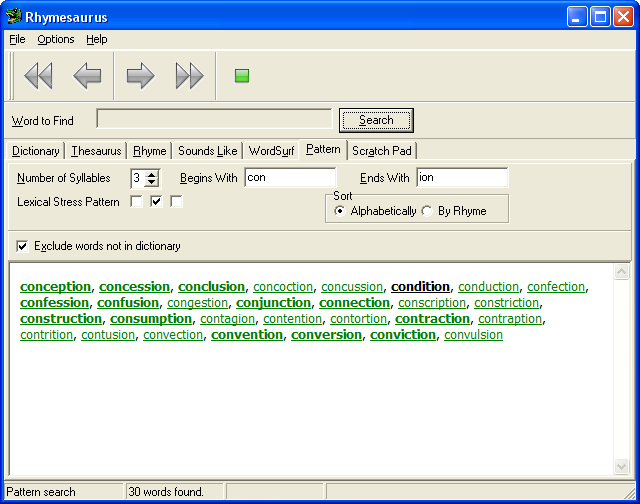 WordSurf is a unique feature of Rhymesaurus. It’s a combination of a dictionary, thesaurus, reverse dictionary, and much more. With WordSurf, you can not only look up definitions, synonyms, antonyms, related words, and words with similar, but not exact, meanings, you can also find the parts and/or types of a given word. For example, if you type in “piano,” you can find it’s types, including “grand piano,” “player piano,” and “upright piano.” You can also find that it is a type of “stringed instrument” and “percussive instrument.” With just another click or two and you can find a list of other stringed instruments or other percussive instruments. Click on “has parts” to discover the parts that make up a piano, such as the keyboard or fingerboard, the fallboard, the sustaining pedal, the soundboard, and more. With WordSurf, you can “surf” the lexical relationships between words, giving you flexibility you won’t find in any dictionary or thesaurus, allowing you to find the word you are looking for quickly, and discover words you didn’t even know you were looking for. If you write metrical verse, song lyrics, or any other form of rhythmical writing, you need to select words based on their patterns of lexical stresses. By creating recurring accent patterns in your words, you create a rhythm or a beat that helps your words flow. Rhymesaurus helps you find words based on the number of syllables and the placement of the accents within the word, as well as by their beginning and ending sounds. For example, if you might look up a list of all of the two-syllable words that begin with the letter “R,” end with “ing,” and have the stress on the first syllable. This would give you words such as “racing,” “reading,” “rising,” “running,” and more. You can sort the results alphabetically, or by their end rhymes, and Rhymesaurus will automatically highlight the results for you based on their frequency of usage in English. Operating Systems: Rhymesaurus runs on Windows 95, 98, ME, NT, 2000, XP, Vista, and Windows 7. Disk Space: 160Mb minimum free disk space. Memory: 40Mb free memory recommended. CPU: 1Ghz or faster recommended.